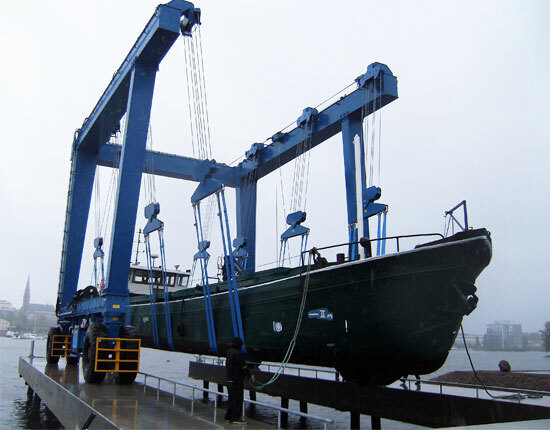 Boat lift crane is a sort of lifting equipment designed for marine-duty applications. It is preferred when the vessels to be moved approach 10 tons to 1200 tons and even beyond. 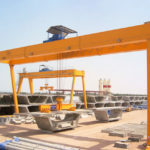 Compared to other types of vessel handling equipment, the boat crane lift is a kind of mobile boat hoist that allows you to position it anywhere you want it to be, which makes the movement more convenient and flexible. 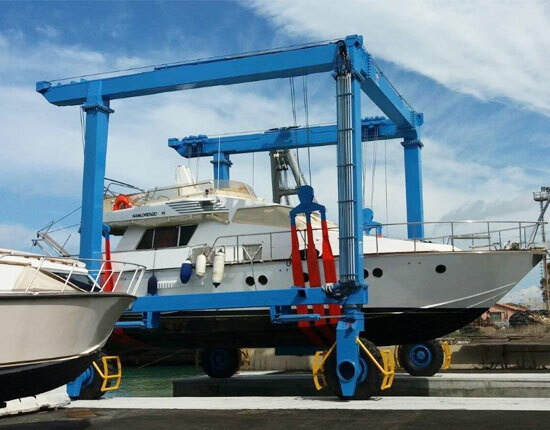 Our boat lift cranes are capable of handling small to large-sized yachts or work boats with the utmost safety and efficiency. 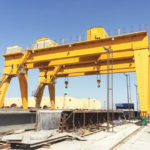 Boat lift crane produced by our company is designed with the latest technology and safety features to make sure it delivers the optimal and durable performance in the boat hauling process. 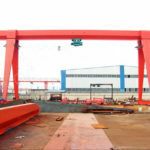 As a non-standard lifting equipment, the boat lift boat crane be custom designed and built to meet your specific requirements. 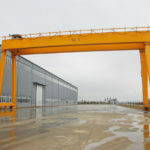 Generally, the boat crane can be classified into hydraulic boat lift and electric boat hoist according to power source, yacht lift, sailboat lift and wooden boat hoist according to the type of vessel to be moved, remote control boat hoist and cabin control boat crane according to the operation mode. 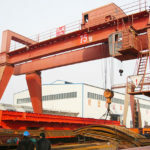 If you are unsure as to which type of boat lift crane can best serve your needs, please feel free to contact us online. We will assist you to select the most economical and powerful boat lifting solutions. 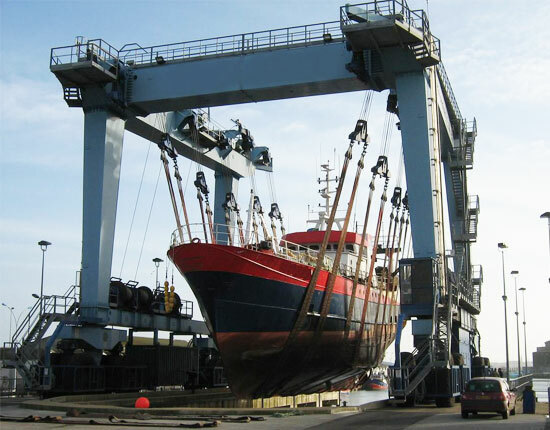 How Can A Boat Crane Lift Benefit Your Business? The marine boat lift crane is primarily found in or near a body of water to perform the lift-in and lift-out work. It makes the hauling of a boat easy and efficient. The boat crane lift has large carrying capacity, which enables it to move heavy loads in a great speed. When you need to launch a newly built boat into water or haul a boat out of water, then a mobile boat crane can perfectly meet your requirements. 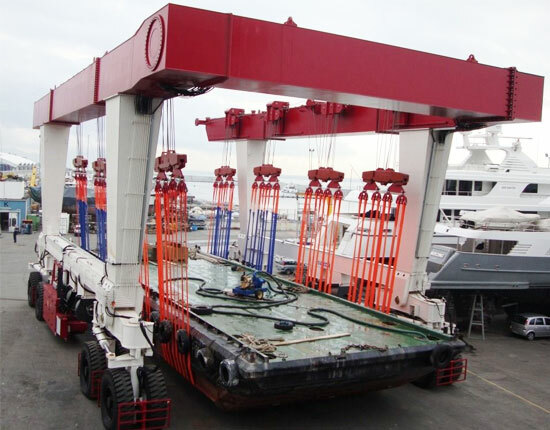 The mobile boat lift crane can also be used to lift and move the hull of a boat in the shipyard for maintenance and repair. Additionally, it can be utilized in your yard to arrange large boats in rows so as to increase the utilization of limited yard space. The crane for lifting boats is meant to facilitate operations of harbor and dockside as well as to ensure a safe lifting operation. The boat lift is easy to operate which requires a single operator and a coordinator to implement the operation work. By means of remote control or cabin control, it can better protect the staff within the work area. Ellsen travel lift is specifically engineered for the enhanced efficiency and safety in boat handling process. We focus on the most practical needs of customers to help them with increased productivity and maximum usage of yard space. When it comes to the boat lift design, it involves a number of fundamental and critical components and units. Basically, the boat lift crane consists of a double gantry U frame structure that allows it to support a large boat easily. The articulated main and end beams can perfectly eliminate structural stress when running on uneven ground. The boat hoist is typically driven hydraulically. However, small boat lift crane can be designed and built with electric transmission system if needed. Variable span design allows for additional clearance for different vessel configurations. The slings can be adjusted to balance the load equally as well as customize each lift. The travelling and steering modes vary widely. Generally there are straight travelling, oblique travelling, fixing axle steering, 90 degree steering, Ackermann steering and so on for you to choose from. The wheel electronic or hydraulic steering system provides precision steering control for boat handling. The remote control and cabin control offer increased convenience and safety for lifting operations. There are several factors determining the types and configurations of your travel lifts, including the boat size, weight, working environment, safety precautions and the size of specifically designed wharf. Considering the marine salt-water environments where the boat lift crane is frequently applied, special materials, stainless steel and superior paint are utilized to prevent the machine from corroding and extend its life. Our boat travel lift will be designed with your goals in mind. For further information, contact our sales team now! 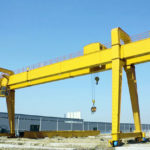 We provide a series of standard boat lift cranes to suit different needs and working conditions. If the provided travel lift specifications and configurations cannot meet your requirements, we are also able to custom design and build a solution with our professional engineers. 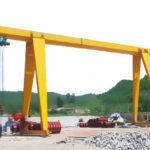 We promise that the crane components are sourced from reputable and reliable suppliers. Besides, with our excellent technical team and advanced production facilities, we can produce high quality marine hoists that deliver efficient and durable performance. Our boat lift crane requires low operational cost, little maintenance and low energy consumption, thus it is capable of getting the job done efficiently, safely and cost-effectively. Whatever your requirements for marine hoist, we are able to help you design the best solution for your needs. If you would like to buy a boat lift crane, just feel free to contact us. We Look forward to cooperate with you in the near future! 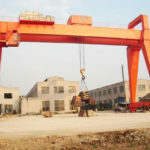 We are experienced lifting equipment provider in China, dedicated to solve any issue you meet within the material handling industry. Our products include overhead crane, gantry crane, jib crane, hoist, winch and travel lift to meet different needs of customers. We provide one-stop solution encompassing the crane design, fabrication, delivery and after-sale services for clients to simplify their order process. We value much on quality, safety and environmental friendliness so we never sacrifice quality for profit. 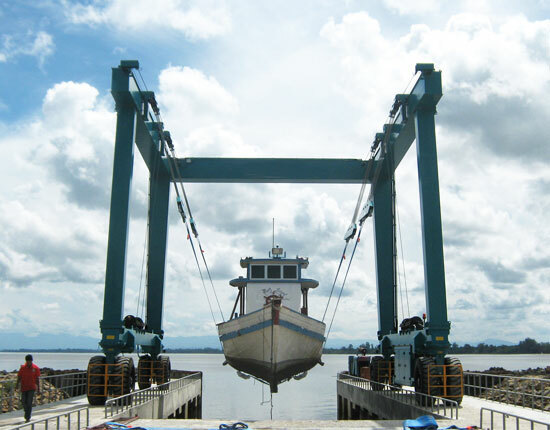 Looking for dependable boat lift crane manufacturer and supplier? Ellsen can be your first choice!